Thank you to the creator of Chicken Cordon Bleu BITES! My co-worker first introduced these heavenly fried appetizers to me at Allendale Bar and Grill, better known as AB&G during happy hour one day after work. When I tell you that I think of these flavorful bite sized snacks on a daily basis, I would say I was being modest. Who would have thought the frozen chicken cordon bleu dinners I had growing up actually had hope? These mini versions of my childhood memories skyrocket the charts as far as taste! You know what makes them taste even better? 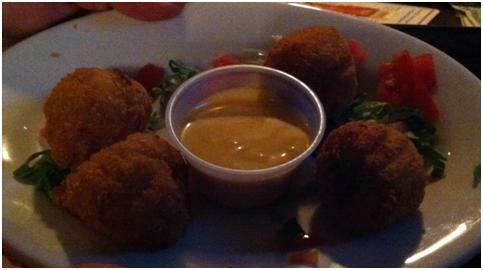 You can buy an appetizer for only $3 during happy hour at Allendale Bar and Grill. I have to say I was there today celebrating a good friend and co-worker’s birthday (HAPPY BIRTHDAY, MAUREEN) so I will have to wait another week until I have another excuse to indulge in the oh-so-good chicken bites from heaven.